An indie comedy-drama about a high school senior that's trying to deal with teenage life, while living with her overbearing mother in early 2000s Sacramento. The film was written and directed by first time feature filmmaker Greta Gerwig, who also co-wrote 'FRANCES HA' and 'MISTRESS AMERICA' (with director Noah Baumbach), which she also starred in. It stars Saoirse Ronan, Laurie Metcalf, Tray Letts, Lucas Hedges, Timothee Chalamet, Beanie Feldstein, Stephen McKinley Henderson and Lois Smith. It's received unanimous rave reviews from critics so far, and it's also been nominated for multiple prestigious awards as well. I really enjoyed it. The story is set in Sacramento, over the school year of 2002 and 2003. 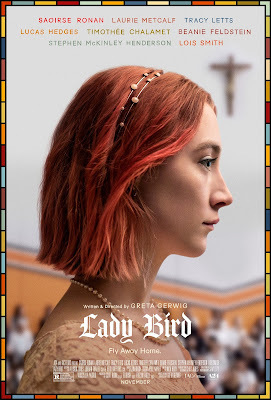 It revolves around a senior named Christine McPherson (Ronan), who has changed her name to Lady Bird. Lady Bird struggles to get along with her overbearing mother (Metcalf), and she applies to multiple colleges outside of Sacramento, against her mother's wishes. She also struggles to get along with the other students at her school, and romantic relationships with boys her age are especially a challenge for her. The story concludes with Lady Bird going to college, and you'll have to watch it to see where she ends up going. The movie is a great coming-of-age tale, that seems to perfectly capture a time and place in a certain person's life. Ronan is awesome in the lead, and Gerwig definitely proves she's a talented filmmaker as well. The film is funny, sweet and it touches on a lot of important issues, I think, to a young person Lady Bird's age. The relationship depicted between her and her mother is also really touching at times too. I definitely recommend it.